We present a case of a 46-year-old Hispanic male with history of B-cell Acute Lymphocytic Leukemia, Philadelphia chromosome negative and CD20 positive, on remission, receiving maintenance chemotherapy (6-mercaptopurine, vincristine, methotrexate, and prednisone), with his last infusion given 2 weeks prior to admission. His symptoms included 3-day history of severe dyspnea on exertion, pleuritic chest pain and nonproductive cough. He denied fever, chills, weight loss or other symptoms. In the Emergency Department he was found to be febrile to 103°F, tachypneic and hypotensive. Laboratory studies revealed pancytopenia with severe neutropenia (absolute neutrophil count 430). 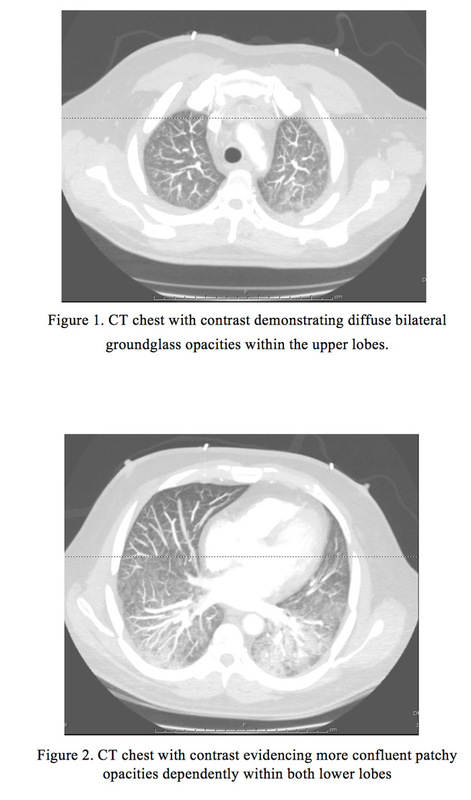 Chest CTA was performed, which ruled out pulmonary embolism but did evidence diffuse bilateral groundglass opacities. Despite fluid resuscitation and biphasic positive airway pressure support, the patient became more unstable and hypoxic, therefore he was transferred to the Intensive Care Unit, where he was intubated and started empirically on broad-spectrum coverage for his neutropenic fever, as well as vasopressors. Further studies included blood and urine cultures, Legionella urine Ag, S. pneumoniae Ag, Histoplasma urine Ag, serum Aspergillus galactomannan, Influenza, AFB stain, and PCP fungal culture; all of which failed to identify the agent causing his acute hypoxic respiratory failure and septic shock. He subsequently underwent a bronchoscopy with broncho-alveolar lavage, which grew Achromobacter xylosoxidans,sensitive to Cefepime and Ciprofloxacin. Patient’s respiratory and hemodynamic status improved, after which he was extubated and completed a 14-day course of Cefepime and Vancomycin along with a 5-day course of Levofloxacin. Achromobacter xylosoxidans is a Gram-negative rod known to cause infections in both immunocompetent and immunocompromised hosts. This organism is frequently found in aquatic environments, including intravenous fluids and water humidifiers. The most common presentation reported in the literature is of an uncomplicated bacteremia; although A. xylosoxidans can involve multiple organs and systems including the lungs, urinary tract and central nervous system. Specifically, lung infections are commonly presented as community-acquire pneumonias (88%) in patients with underlying malignancies. In our patient, we suspect this was a healthcare-associated infection given his multiple hospital visits. Although A. xylosoxidans is considered to be of low virulence, infected immunocompromised patients are associated with high mortality. Case fatality rate is reported as 30% in cases of bacteremia and up to 67% in cases of pneumonia. The most commonly observed underlying medical comorbidities in the setting of A. xylosoxidans infection are: malignancy (30%), cardiac disease (21%), and immunosuppression (27%). Although A. xylosoxidans is usually resistant to ampicillin, cephalosporins, aminoglycosides, and fluoroquinolones, standardized sensitivities and optimal antibiotic therapy has not been well established. This case highlights the increasing number of case reports suggesting serious infections caused by A. xylosoxidans. Despite this increasing evidence, most clinicians are unaware of this potential life-threatening organism and its significance whenever it is isolated. Additionally, its inherent multidrug resistance and lack of treatment guidelines makes treatment difficult. Llanos-Chea F, Rauseo A, Quintana-Quezada RA, Yeh YC. Achromobacter Xylosoxidans Healthcare-Associated Pneumonia in an Immunocompromised Patient. Abstract published at Hospital Medicine 2016, March 6-9, San Diego, Calif. Abstract 648. Journal of Hospital Medicine. 2016; 11 (suppl 1). https://www.shmabstracts.com/abstract/achromobacter-xylosoxidans-healthcare-associated-pneumonia-in-an-immunocompromised-patient/. Accessed April 25, 2019.